This one is customized just for the two of you! Make 2019 the most memorable Valentine’s ever with this personalized offer just for you! 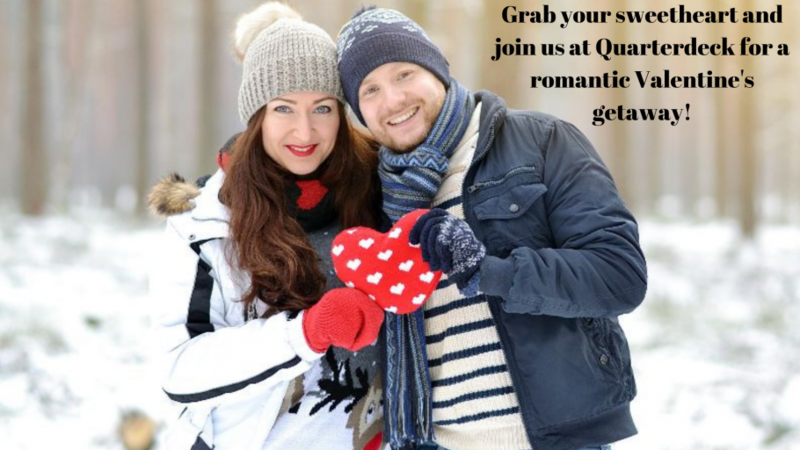 Stay at Quarterdeck Resort any time between February 8th and 16th and we’ll help you arrange a unique romantic getaway. We can create an experience that takes advantage of everything Quarterdeck and the Gull Lake area has to offer! Lakeside Lodge Suites start at just $129 per night. EVERY room at the Quarterdeck Resorthas a fireplace – ask to book one with a hot tub for maximum romance. Total package prices vary depending on options. Resort fees and taxes apply. Don’t see something you’d like to do? We’ve got even more ideas to make your trip as special as possible. Let the romance experts at Quarterdeck arrange your most memorable Valentine’s Day getaway ever. Call us today 218-963-2482 or email us us.